Recently, although Cisco is suffering a trust crisis because of the Prism Project in China, for worldwide network users Cisco hardware, especially those popular items (such as Cisco 800 series, Cisco 1900, 2900, Catalyst 2960-S, Cisco 3750-X/3560X switches, Cisco ASA 5500 series and so forth.) is still the top choice to constructing an advanced, safe and stable network. · SYS: Solid green —normal operation. Blinking green —System is booting or is in ROM monitor mode. Off —Power is off or system board is faulty. · ACT: Solid or blinking —any packets are transmitted/received on any WAN/LAN, or when monitoring system activity. · PoE: Green —PoE is available. Amber —Power supply is not supplying PoE power. S (Speed): 1 blink + pause —GE port operating at 10 Mb/s. 2 blink + pause —GE port operating at 100 Mb/s. 3 blink + pause —GE port operating at 1000 Mb/s. · L (Link): Green —GE link is established. Off —No GE link is established. · 1 AUX port (auxiliary port) —RJ-45 connectors for Remote configuration. · GE 0/0 & 0/1—Two Gigabit Ethernet ports (RJ-45 connectors). · High-speed USB 2.0 ports enable another mechanism secure token capabilities and storage. Well, by this way, we can be clear of the structure and functions of Cisco hardware at a glance. 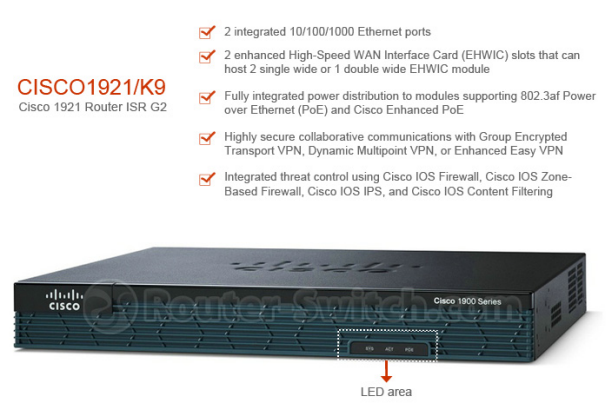 If you need to get that information of these hot Cisco products, you can refer to the related pages at router-switch.com. The first batch of Cisco hardware files include CISCO881-K9, CISCO1921/K9, CISCO1921-SEC/K9, CISCO1941/K9, CISCO1941-SEC/K9, CISCO2901/K9, CISCO2911/K9, WS-C2960S-24TS-L, WS-C2960S-24TS-S, WS-C2960S-48TS-L, WS-C2960S-48TS-S, WS-C3560X-24T-L, WS-C3560X-24T-S, WS-C3750X-24T-L, WS-C3750X-24T-S, WS-C3750X-48P-S.
More diagrams, note files and necessary advices related to main Cisco equipment will be uploaded soon, more surprises, expectation here!